If you want better water, but not at the expense of the environment, look to Kinetico. Unlike other water treatment options, Kinetico systems use the laws of nature to operate, without taking a toll on Mother Nature. Our systems use less salt and water, work better and last longer, which keeps them out of landfills. In fact, we have customers who have had their Kinetico systems for more than 20 years! And by using a Kinetico system, you’ll minimize waste and energy use, eliminate the purchase and disposal of plastic water bottles, reduce the need for harsh cleaners and chemicals and help your water-using appliances work better and last longer. The bottom line is a Kinetico Water System is good for you, your home, the environment and your wallet. A study showed softened water reduced weekly household cleaning time from 4 to 2 hours, 21 minutes - saving more than 10 days per year! Enjoy the everyday experience of softer and silky hair and revitalised, moisturised and bright looking skin. Softened water removes any residual impurities making your clothes feel softer and keeps them looking brighter and newer for longer. We have all heard of it - but what exactly is soft water? Or, for that matter, hard water? Whether your water-supply consists of hard or soft water is determined by the geology of the ground that the rain in your region falls upon. Pure rainwater is naturally soft but the chalk and limestone regions of the South and East of England surrender Calcium and Magnesium into the natural water supply to create hard water. The granite areas of the North and West do not contain the same minerals and so the water remains 'soft'. And with the development of water distribution networks, some parts of the UK which have historically been soft water areas, are now beginning to experience hard water. There's nothing quite like a glass of great tasting water. Great water makes every thing else taste better including your favourite drinks and recipes. Filter jugs are slow,clumsy and produce a limited amount of water, tap mounted filters are unattractive and awkward and bottled water is expensive, cumbersome and could be up to two years old. Kinetico Drinking water systems and Filters make it easier than ever to get quality drinking water straight from the tap 24 hours a day every day. » If you are concerned with fluoride in the water, our K5 Drinking Water Station can remove everything from your water that is not water. SAVE MONEY. Look and Feel Great. With soft water in your home, all the time you spend dealing with limescale will now be your free time to do the things you really want to do. To ensure you receive the full product warranty, only purchase Kinetico products from your local authorised Kinetico dealer. I'm sure you've heard the terms 'hard water' and 'soft water', but do you know what they mean? Is one type of water somehow better than the other? What type of water do you have? Let's take a look at the definitions of these terms and how they relate to water in everyday life. 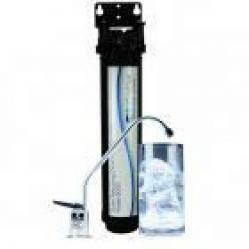 Hard water is any water containing an appreciable quantity of dissolved minerals. Soft water is treated water in which the only cation (positively charged ion) is sodium. The minerals in water give it a characteristic taste. Some natural mineral waters are highly sought for their flavor and the health benefits they may confer. Why might you use a water softener? The answer is that extremely hard water may shorten the life of plumbing and lessen the effectiveness of certain cleaning agents. When hard water is heated, the carbonates precipitate out of solution, forming scale in pipes and tea kettles. In addition to narrowing and potentially clogging the pipes, scale prevents efficient heat transfer, so a water heater with scale will have to use a lot of energy to give you hot water. Soap is less effective in hard water because its reacts to form the calcium or magnesium salt of the organic acid of the soap. These salts are insoluble and form grayish soap scum, but no cleansing lather. Detergents, on the other hand, lather in both hard and soft water. Calcium and magnesium salts of the detergent's organic acids form, but these salts are soluble in water. Hard water can be softened (have its minerals removed) by treating it with lime or by passing it over an ion exchange resin. Water flows over the resin surface, dissolving the sodium. The calcium, magnesium, and other cations precipitate onto the resin surface. Grant Audemard, Managing Director of Kinetico UK Ltd said of the new system: “The Worcestershire Royal Hospital water treatment system is state of the art and reflects a growing trend amongst our medical customers looking for the best quality water for their application. During 1978 Kinetico Incorporated appointed a UK distributor / assembler. With financial and design assistance from Kinetico Incorporated, this Surrey based distributor/assembler developed a non-electric water softener which best suited the UK market and, through this continued joint venture, the Kinetico Block Salt water softener was evolved. Kinetico Incorporated takes great pride in the expert resources of its research and development department and became increasingly frustrated with the reluctance of its UK distributor/assembler to implement key product improvements that would benefit the consumer. As a result, during the latter part of 2000, Kinetico Incorporated terminated its long standing commercial relationship with the UK based distributor/assembler and established its own UK subsidiary, Kinetico UK Ltd, operating from Southampton, Hampshire. This turn of events enabled Kinetico Incorporated to immediately implement improvements to the established water softener design bringing it into the 21st Century. Since 2001, Kinetico have made over 35 improvements to its block salt water softener blueprint and, due to the ingenious way the water softener is designed, Kinetico can and do continue to service and maintain its earlier models. During the history of Kinetico a few companies have introduced their own non-electric water softener but to date none have been able to compete with the performance ratings, reliability and benefits of a Kinetico non-electric water softener, nor have they achieved independent accreditation. Kinetico continues to develop the most innovative water treatment systems available anywhere in the world. Systems that conserve energy and engineered with an eye towards sustainability. When Broadcrest UK, part of multinational digital media producer MPO, relocated and expanded its CD manufacturing facility, it took the opportunity to upgrade its ultra-pure water supply with the latest reverse osmosis (RO) and deionising (DI) equipment from Kinetico UK. The manufacturing process involved in creating the “stamper” plates used to press CDs is complex, is carried out under conditions of laboratory cleanliness, and involves several steps that require the use of an ultra-pure water source, both for washing and for use in electrolysis solutions. Hard water is formed when rainwater passes through chalk and limestone rocks, absorbing calcium and magnesium minerals. In an estimated 60% of UK homes, the mains water supply is 'hard', with Eastern, Central and Southern UK water defined as 'hard to very hard', due to the geology of these regions. The minerals contained in hard water settle out as a deposit of hardness scale, wherever the water is heated or when cold standing water evaporates. Examples of this include; white marks, stains and scale on sinks, baths, toilet bowls and around the base of taps, blocked shower heads, scale deposits on kettles and water heating elements and clogging of pipe work. A team of scientists found that 70% of popular bottled water brands have surprisingly high levels of bacteria and significantly higher levels than tap water.Although not a major risk to most people, these levels could pose a threat to vulnerable members of society such as the elderly, pregnant women and children. Producing and delivering bottled water can create hundreds of times more harmful greenhouse gas compared to tap water. We can buy bottled water that is flown in from all over the world, from countries such as Fiji where one third of the population doesn’t have access to clean drinking water. And it’s not only the producing and delivering that costs the environment. As only 1 in 4 plastic bottles are recycled, the rest are dumped in landfill sites (or littering our streets, park, rivers and beaches). It will then take 450 years for these plastics to break down. Fluoride in the water - even if you don’t want it! A health trust has become the first to force through a move to add fluoride to tap water to fight tooth decay in children. Whether you are buying a new bathroom or kitchen or are just simply fed up of the continual cleaning and scrubbing as a result of living with hard water, there has never been a better time to install a water softener. Living in a hard water area can damage your home! From the obvious scale build-up on shower screens, granite worktops, sinks and taps through to the invisible long-term and costly damage to washing machines, plumbing systems and pipe-work. Keep your kitchen and bathroom looking as fantastic as the day they were bought. Save time and money with less cleaning. No more hard water, scum or stains. Maintain the efficiency of your heating system and increase the life of your water using appliances. ... and believe it or not you can save up to £400 a year too! Spend less on cleaning products, use up to 75% less toiletries and detergents and save up to 25% on energy bills thanks to more efficient household appliances.